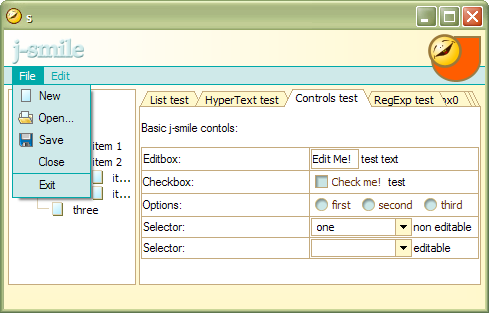 J-SMILE is my implementation of JavaVM and GUI runtime. Main idea is to create as compact as possible VM and runtime primarily targeted on implementation of applications having modern ergonomic user interface. J-SMILE-VM capable to run bytecodes (stored in class files) produced by Javatm compiler from Sun's JDK v. 1.2.2.
demo exe bundle - self-sufficient exe module for (Windows 2000 and Windows XP only for a while). No need for any Java runtime to run demo application as this single application includes J-SMILE-VM (JavaVM), SMILE runtime and compiled class files. Ideas of J-SMILE-VM implementation was taken from WABA, SUPERWABA and GVM.